Minnesota allows students to earn dual credit in academic and/or CTE dual-enrollment courses through Postsecondary Enrollment Options program and the career and concurrent enrollment offered at their high school, postsecondary institution, or online. Public postsecondary institutions are not required to accept these credits. “However, the Board of Trustees of the Minnesota State Colleges and Universities and the Board of Regents of the University of Minnesota must, and private nonprofit and proprietary postsecondary institutions should, award postsecondary credit for any courses in a program certified by the National Alliance of Concurrent Enrollment Partnerships (this applies to courses taught at a high school and taught by either a secondary teacher or postsecondary faculty member)” (Education Commission of the States, 2015). More information about dual enrollment in Minnesota is available at the Minnesota Department of Education website. Early College High School at Irondale High School recently began the process of becoming the first comprehensive Early College High School in Minnesota. Anoka-Ramsey Community College and Irondale High School partnered to launch the Early College High School program in fall 2012 for ninth and 10th graders, with full implementation by 2014–15 (Mounds View Public Schools, n.d.). More information about Early College High School at Irondale High School is available at the Mounds View Public Schools website. Within these areas, Minnesota implements programs of study aligned with all 16 Career Clusters. In 2013, Minnesota mandated that all students in Grades 9–12 have a Personal Learning Plan (PLP; U.S. Department of Labor, 2013). The PLP is portfolio-based and includes comprehensive academic and life planning tools. It should be revisited and updated annually (Minnesota Department of Education, 2014). 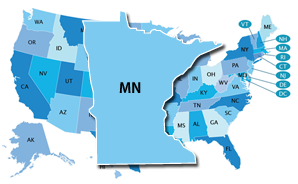 Minnesota’s state-specific Early Warning System is called the Minnesota Early Indicator and Response System (MEIRS). Early Warning System Data are reported at the student, school, district, and state levels. Superintendents can request access for principals, school psychologists, counselors, and other staff.